The artists and designers of the Class of 2014 at Otis College of Art and Design are presenting a two-day, public exhibition of their work on Saturday and Sunday, May 10 and 11. Otis’ annual exhibition has a long and rich history and this year the program has changed from a weekday event to a weekend-long celebration of innovation and creativity. For two days, the entire campus is being transformed into an art fair featuring the final projects of the year by the seniors receiving Bachelor of Arts degrees in a wide-range of majors including Architecture, Landscape, Interiors; Communication Arts; Graphic Design; Fashion Design; Painting; Photography and Toy Design. The weekend’s impressive schedule begins at 10 a.m. on Saturday, May 10 with the opening of the Annual Exhibition on view through 9 p.m. that night. In between, there is a student art sale, as well as an Open House for Continuing Education from 1 p.m. to 3 p.m. This will give the public the opportunity to find a new work of art for a budding collection and also to learn about the wide range of art and design classes being offered this summer for adults and K-12 students. Saturday evening, for the first time ever, the Fashion Department is presenting a live runway show of student designs in front of the Galef Fine Arts Center at 7:45 p.m. This is a tailor-made variation of the legendary Annual Otis Scholarship Benefit Show that takes place on the first weekend in May at the Beverly Hilton Hotel and annually raises over a million dollars in much needed scholarship funding. To top off the evening, the students from the Graduate Public Practice program have commandeered El Dorado Lanes (the bowling alley across the street from Otis) for an ongoing interactive performance from 6 p.m. to 10 p.m. The Annual Exhibition opens again to the public on Sunday, May 11 at 10 a.m. and will close down at 2 p.m. in preparation for the commencement. This year, Otis will bestow Christopher Guy Harrison with an honorary doctorate. Harrison is the internationally acclaimed founder and head designer of the luxury furnishings brand Christopher Guy. Admission and parking are free to the events, which are located on the school’s campus at 9045 Lincoln Blvd. in Westchester. Meg Linton is the Director of Galleries and Exhibitions at Otis College of Art and Design and is a contributing columnist on the arts in the community. 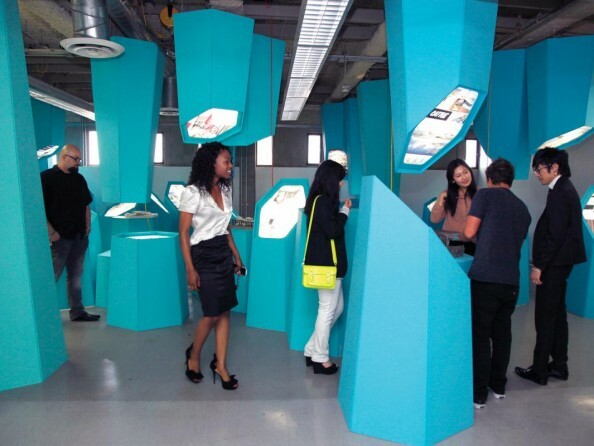 Pictured: Otis students peruse the Architecture, Landscape and Interiors installation at the Westchester campus. The school will be open to the public during commencement weekend.PHOTO BY KRISTINA CAMPBELL.